Last year, I discovered the art of candle making. Who knew it was so easy?! I am now addicted and looking for any container I can get my hands on to fill with melted wax and transform into a candle. Old jars, fancy tea cups and even eggshells. Nothing is safe from being filled with melted wax! 1. Clean your eggshells in some soapy water and rinse. 2. Place a few drops of food dye into a bowl of vinegar. One bowl for each colour. 3. Place your eggshells in the dye bath and roll them through the dye for about 30 seconds. Keep the eggshell in the dye for longer if you want a stronger colour. You can use a spoon if you don’t want to colour your fingers. 4. Dry your coloured eggshells on some paper towel. 5. Place dried eggshells into an egg carton. 6. Cut a piece of wick to 10cm in length and thread it through your metal tab. 7. Secure the metal tab & wick to the bottom of eggshell using a hot glue gun. 8. Tie the pieces of wick to a wooden skewer to keep the wick out of the wax. 9. Place your soy candle wax into a pyrex jug (or a double boiler saucepan). 10. Place jug in boiling water on stove and wait until it melts. It will become clear when it’s ready. Take it off the heat as soon as it has melted. 11. Pour the melted wax into the eggshells as carefully as possible. 12. Leave your eggshells to dry for a few hours and once the wax is hard you can remove the wooden skewers and trim the wick. 13. Place your new candles in some ceramic eggcups or make your own candle holders. My eggshell candles are now sitting on my kitchen windowsill alongside my eggshell succulents, but they’d make a great outdoor table centrepiece on a summer evening and you could even add some insect repellent essential oils! - Add scent to your wax. - Melt down an old candle or old crayons to add colour to your wax. - Secure a birthday candle in the middle of the eggshell instead of a wick. - Just skip the whole coloured bit and use plain eggshells. Very stylish. What would you make into a candle? What is your favourite candle scent? This post is part of a series on Easter crafts, recipes and activities here on Frog, Goose and Bear. You can click here to see all of the other posts in the series. Even better, if you’d like to do a guest post for this series, I’d love to hear from you! * I purchased my candle supplies from Spotlight, but I’m sure you’d be able to find them at your local craft supply store. * This post was originally published on Kidspot Village Voices in 16 Nov 2012. 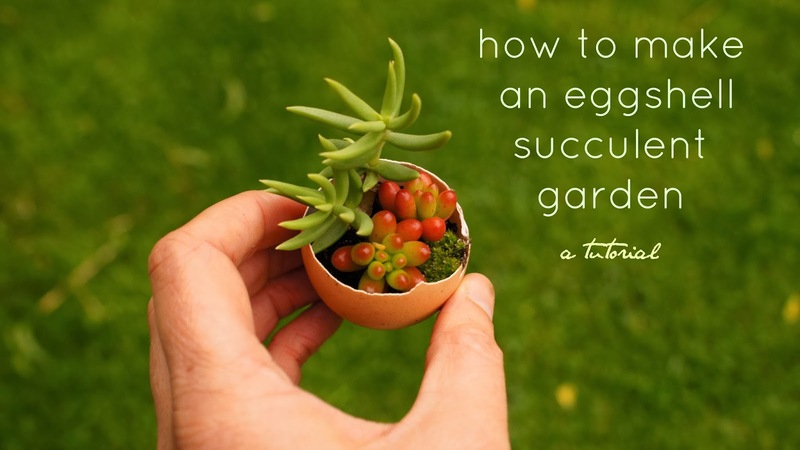 Taking inspiration from around the web we made our own little mini eggshell succulent garden. 1. Give your eggshells a quick clean (I just rinsed mine under the tap), let them dry and pop them into the egg carton so your egg shells remain upright. If you don’t have an egg carton on hand, an eggcup or cardboard tube cut to size would also do the job. 2. Fill your egg shells with soil until they’re about 3/4 full. 3. Insert your succulent cuttings into the soil. Succulents are one of those amazing plants where the roots just grow when a cutting is placed into soil. 4. Gently give your new creations a light spray of water using a spray bottle. You will only need to spray your succulents every now and then as they do not like being too wet. The eggshell succulents look pretty cool displayed in the egg carton and would also look stylish in ceramic egg cups. We made our own egg cups by cutting a toilet roll into three and gluing on some origami paper. I have a bit of a thing for origami paper, but you could use paint, fabric, wool or lace to decorate if you felt so inclined. They are now proudly displayed on our window sill above the kitchen sink. I was lucky enough to have a good friend who grows a great variety of succulents who gave me lots of small cuttings to play with, but if you can’t find any in a backyard near you, you will have no trouble finding them at your local nursery. Have you ever planted anything in an eggshell? I am currently running a series on Easter crafts here on the blog, so if you have an Easter craft you’d like to share in a guest post on Frog Goose and Bear – shoot me an email coz I’d LOVE to hear from you! *This post was originally published on Kidspot Village Voices on 6 October 2012. We’ve been planting tiny succulents in eggshells. You can head over to Village Voices for the FGB tutorial to see how we made them if you’d like to have a go at making some yourself. They are super easy and I love seeing them on our kitchen windowsill whenever I’m at the sink. I’m really excited to be doing a whole lot of crafts using eggshells for Village Voices over the next few months. Have you ever used eggshells for craft?